It’s Monthly Midnight Madness’ 4th birthday! In honor of that we have our Paisley outfit in a special MMM edition. At midnight SLT we will offer the Paisley skirt. At noon SLT we will offer the our Paisley top. In order to get these gifts you have to be in the MMM group and abide by the MMM rules (which you can find here: https://www.xxsaltandpepperxx.com/monthly-midnight-madness/). PLEASE STAY BELOW 50K complexity. The boards won’t give gifts to avatars above 50K complexity! 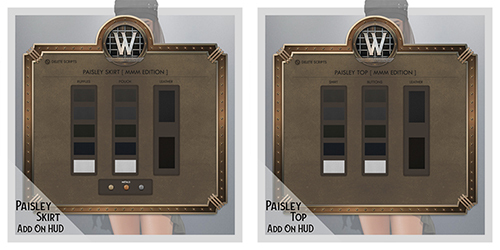 We will also be offering add on HUDs for both the Paisley top and skirt. This add on HUD will provide you with additional customization options for the skirt ruffles, pouch, leather and metals. On the top the add on HUD will allow you to change the texture of the shirt, buttons and leather. The add on HUDs will cost you L$50 each as a part of the MMM group. Members of our Wicca’s Wardrobe group will get the add on HUDs for free! For all who missed the gifts, there is a Last Chance option on Sunday, February 10th. The items will be offered for L$50 except Wicca’s Wardrobe group members who will get the gifts for free. In celebration of 4 fun filled years of MMM, all participating creators will be offering their MMM creations from the past year at the ULTIMATE LAST CHANCE location. These past gifts will be offered to MMM groups for up to L$99. Our past items will be offered for L$75 each.